JMIFET and RNF Technologies jointly held a mentorship session today in the Faculty of Engineering and Technology Auditorium. RNF Innovation Cell was formally started off by Mr. Faisal Abbas Abidi, director and co-founder RNF Technologies, and Prof Majid Jamil, Officiating Training and Placement Officer, JMI. 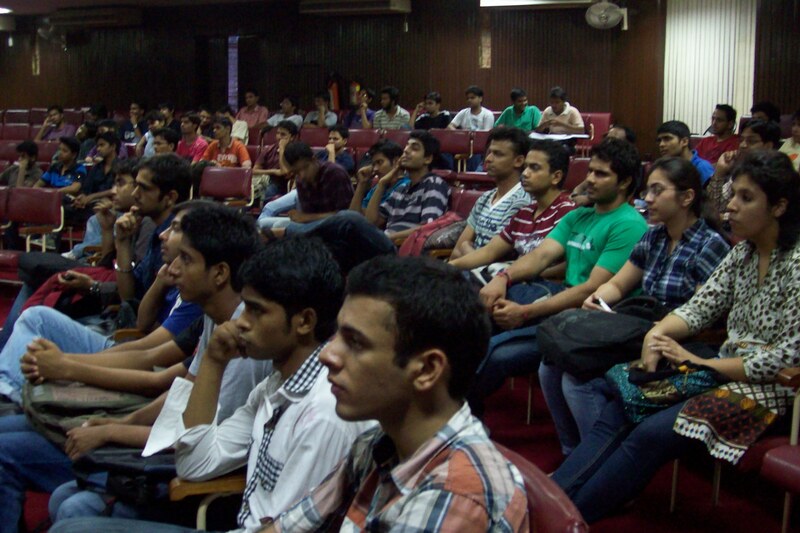 It is a unique initiative by JMIFET and RNF Technologies which aims to guide students on becoming successful entrepreneurs and choosing the right direction for themselves in their respective careers. Prof. Majid Jamil welcomed Mr. Abidi to the Faculty and congratulated him on setting up RNF successfully in such a short span of time. While pointing out that 95 per cent of the JMI graduates end up in the corporate world, he exhorted students to look think creatively and not follow the herd. He also emphasized the need to consider other avenues as career choices such as civil services (IAS) and engineering services (IES) so that JMI can have a fair representation in these elite institutions. 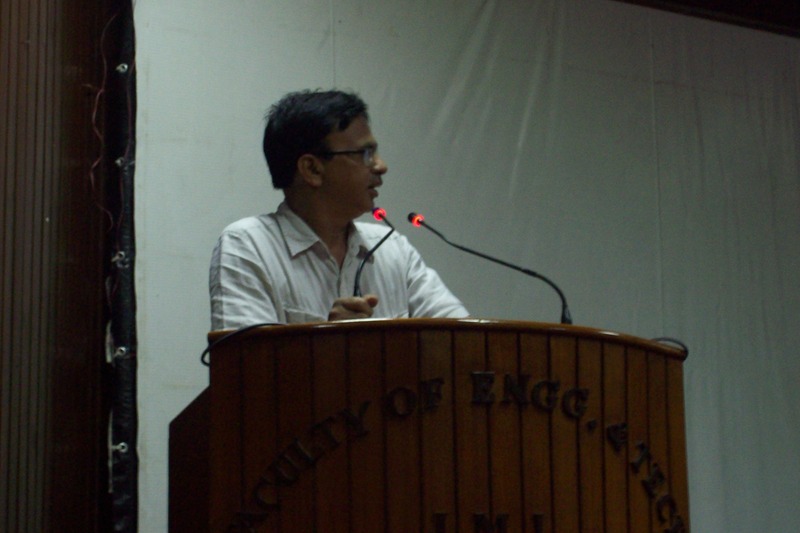 Taking over the dais from Prof. Majid Jamil, Mr Faisal Abbas Abidi said that the current lot of engineering students has developed an aversion to creative thinking and innovation, focusing instead on mugging up things for scoring maximum on the exams. He asked students not to follow the herd and suggested that they try unconventional, uncharted paths, which are risky no doubt, but give much better returns. He also pointed out that going for MBA straight after graduating may not be such a great option. This was a jibe against the conventional wisdom that admission in IIM is equivalent to huge pay packet. Instead he said that most of the freshers in IIMs draw about 7-8 lakh per annum. Speaking about his summer internship experience at Swinburne University, Australia while in college, he said that it is important to apply to as many institutes and universities as possible. He also asked students to work on technical papers for national and international conferences. He reiterated the need to show quality work to the prospective university or employer through achievements in public competitions. In this regard, he mentioned organisations like Topcoder and ACM which organize international online coding contests through which companies like Google, Facebook, AOL, etc. hire employees. 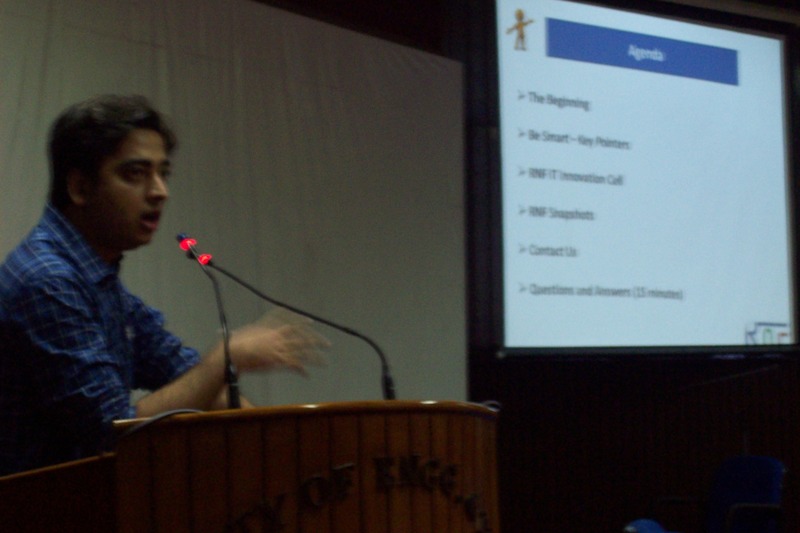 Mr. Raghib Khan, director and co-founder of RNF, was recruited by AOL on Topcoder. He took questions from students afterwards. One student asked how RNF came about. Another student asked about his experience in Google. He was also asked how he managed seed money for the company. He answered these and many more questions eloquently, and was treated to a jubilant ovation at the end of the session. Questions, however, did not end there; there was a long queue of students waiting to meet the man one on one. A number of students also came up with their projects which are currently under consideration for the mentorship programme by RnF Technologies. The above words aptly sum up the spirit with which JMIFET was conceptualized and brought about a year ago by its founding members. Today, a year later, it is gratifying to say that the journey has had been more of a celebration than a tedious task and more about dedication for the cause and vision which we had set out to seek. 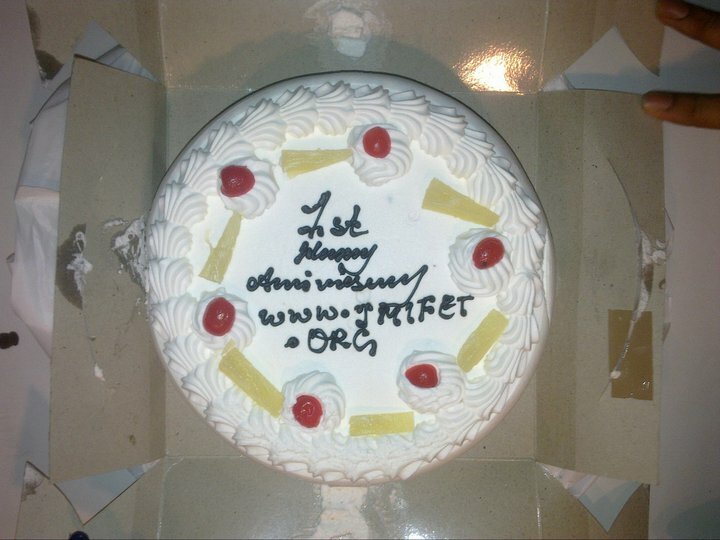 Much has been accomplished and much more needs to be done, and between these crossroads, in a bewildering rush of transformation, the JMIFET Project celebrated its 1st year of existence on 9th April, 2011. It was attended by those inducted in the Project and its Co-ordinators in the FastTrax restaurant, Community Center situated in the New Friends Colony. The attendees were Ankit Talwar, Wasiq Zia, Imran Ali, Faiz Shamsul Haque, Chitra Belwal, Biplob Biswas, Mehwish Khan, Mohd. Aarif Khan and Pankaj Sharma. The ‘official’ cake-cutting ceremony was proceeded by a lunch, amid reminiscence of their times of fun and enjoyment by Ankit Talwar and Wasiq Zia, of the batches of 2008 and 2007 respectively. In all, the moments that would truly define the spirit of the celebration were not only that the cake was shared with the underprivileged children, or when the whole team met and socialized for the first time, but also the feelings of contentment and pride in being members of a team, who came together to work for FET and its righteous due. And under the April Sun, in mirth and snatches of un-contained laughter, these are the moments of solace that render the journey truly worth the effort. Perhaps, a quick introduction is in order at the outset. My name is Kumar Pratyush, and I graduated from the Faculty of Engineering and Technology, Jamia Millia Islamia, New Delhi in 2008. Subsequently I went on to complete PGDBM (Post Graduate Diploma in Business Management) from the Management Development Institute (MDI) in 2010. I shall now take up a position with Axis Bank in the Marketing function this June. I read, I write, I talk and I do a lot of them. Moving on to greater purposes in life, this evening I was the audience to an impassioned plea by a fellow alumnus to contribute something to the FET blog. Therefore, essentially, I absolve myself from responsibility for all the randomness that follows! Let me take this chance to extend my heartiest congratulations for the effort put in by the Web-site team. I am told that this is the fruition of an effort that’s been going on since the September of 2009. I am glad that young blood at Jamia has the purpose, resolve and resourcefulness to come up with something so creative and hopefully useful. A word about the alumni and ‘home-coming’ now. Yes indeed, the alumni network is extremely important and should be a critical thrust area for any institute to thrive. However, I shall be honest here. I no longer feel the same level of connect that an alumnus should. Perhaps the lackadaisical ways of the administration takes some blame. Two years after graduating from the hallowed portals of the college, I haven’t received a single communication from the powers that be, except for the Convocation invitation! To put things into perspective, I’ll give an example of how things work in prestigious universities abroad. I recently returned from ESCP-Europe, Paris after spending a term there as an Exchange student from MDI. Now, I don’t even have a degree from the University, and yet I receive at least two emails updating me on all that’s been happening with the place, it’s alumni and it’s faculty. This ensures that ESCP occupies a top of the mind recall for me, and if the time so comes, I’ll have a bias for action towards the college! On the other hand, slowly, but surely, Jamia is just being reduced to a bullet point on my CV! Now, given this state of affairs, I am convinced that this blog (and the upcoming stages 2 & 3) are just the right initiation, the proverbial shot in the arm needed to establish the connect. Build up an extensive Alumni Database complete with the Alumni’s current positions, contact details etcetera. The FET is over 20 years old now. Several of it’s graduates would now occupy prominent places in industry and academia. Reach out! Send out regular (and that doesn’t mean once a year!) feelers and updates to the Database. This could be in the form of a short newsletter. Enlist the active support of Faculty and Administration. Some words from your favorite professor can work like magic to an alumnus’ ears! Make this official and make this big. Get more people on board. I can see that with the impending expansion of scale and scope, you’ll need more manpower. These people should ideally be enthusiastic young current students. People like Ankit, Shariq and Deep are likely to get busy with their careers sooner than later. Establish a clearer raison de etre. Ask yourself: Why do you exist? The current 5 point vision is ambitious, but it isn’t exactly concise and clear. One could use the famous Porter’s ’5 whys’ technique here. Go on asking a why for your purpose until you arrive at a distilled and precise purpose. Then begin work on it. With the right attitude, and the right people, I am convinced that you can take this far, and ensure that FET’s brand is strengthened to the position that you want to see it at. I guess I have written more than my fair share here now. So, I’ll sign out and wish you great luck for the times to come! May the force be with you!